Located in St. Louis City real estate, homes for sale Holly Hills MO are conveniently located within walking distance to Forest Park. Holly Hills Real Estate and Holly Hills properties are a perfect addition to the St. Louis Real Estate market. Holly Hills real estate is primarily older, historic homes. The name Holly Hills was created in the 1920’s as an ode to old Hollywood. The Homes for sale in Holly Hills MO range in price from approximately $100,000 to $550,000. The median home price in 2014 was approximately $200,000. The homes in Holly Hills range from Brick Mansions to bungalows wide tree lined Boulevards. Residents of Holly Hills also enjoy the third largest park in St. Louis, Carondelet Park. The YMCA provides the Carondelet Park Rec Complex and features pools, volleyball an indoor track and more! The Holly Hills residents are served by the St. Louis City School District including Roosevelt Senior High. See Great Schools for up to date ranking on every school in the area. If you are looking for a home for sale in Holly Hills MO or you would be interested in buying a home in Holly Hills, please contact St Louis County real estate expert, Sharon Colona and St. Louis Realty for a professional and simple buying or selling process. Call (636) 397-7653 or email at scolona@stlouisrealty.net. BACK ON THE MARKET! Beautiful 3-bedroom Tudor-Style brick home in the Grand-Dover Park Historic District in sought after Holly Hills. Holly Hills, aptly named by its developers in 1924, has the elegance of Hollywood in a neighborhood that feels like a small town. Updates and renovations include the chef x2019;s kitchen (custom-designed by a St. Louis restaurateur) featuring a professional Thermador range and oversized refrigerator, private New-Orleans style back courtyard, elegantly remodeled upstairs full bath and Master Bedroom. New A/C, HWH, and flueless gas fireplace (2018). Solid oak hardwood flooring, freshly painted interior, and more! With short walk to Carondelet Park, restaurants, and easy access to the Great Rivers Greenway this home is a perfect oasis to enjoy active, park-style city living. Garage is being sold in AS-IS condition. OPEN HOUSE this Saturday from noon to 2. Gorgeous Craftsmanship & Updates Galore! With architectural charm, this 5 bed, 2 bath, all brick 2 story home offers 2 tiered covered decks, HUGE park-like level fenced yard & is sure to impress! Recently renovated, this 2,600+ sqft home, boasts refinished solid oak hardwood floors, neutral fresh paint, beautiful original woodwork, crown molding, 3 piece base & marble window sills. Updated kitchen features granite counters, new cabinetry, SS appliances including refrigerator & new fixtures. Main floor has open living rm into kitchen, large bath with new vanity & granite top & 2 main level spacious bedrooms with plenty of natural light. Upstairs offers 3 additional bedrooms, family room, 2nd bath & 2nd kitchen. 2 story enclosed porch w/backdrop of windows & separate staircase. All copper plumbing, All PVC drain pipe inside home, Security System, Newer Window Balances, Zoned HVAC, 2 Car Garage, Double Lot, 2 sump pit/pumps! Endless Options: Mother-n-Law Qrtrs, 2 Family or Owner Occupied! BACK ON MARKET! No fault of seller. This Tower Grove STUNNER is back! Hurry in, dont miss your opportunity to live in this highly sought-after neighborhood. Walking distance to Tower Grove park, restaurants & shops on South Grand & the Morgan Ford strip. The home features gleaming hardwood floors in living room, dining room & all throughout upstairs. New slate flooring in entryway & kitchen. High ceilings & large NEWER windows make every room bright & sunny. Updated kitchen w granite countertops & some glass-front cabinets. Temp controlled 4 seasons room off kitchen & dining room w exposed brick & spacious full bath w hookup for washer & dryer for optional main floor laundry. Appliances included. Front loader washer & dryer in walk-out basement. Back patio is great for entertaining or relaxing. Fenced-in backyard includes a 2 spot parking pad. New roof Aug 2018, New HVAC (10 yr warranty) & water heater Nov 2018. Fresh paint throughout entire home. Gorgeous & filled w updates! Classic architectural details, such as the pocket door, original mill work, stained glass window, two decorative fireplaces, and wood flooring, abound in this nearly 1,800sf two-story home, just blocks from Tower Grove Park. Traditional floor plan features a living room, dining room, half bath, kitchen, and breakfast room on the first floor. 2nd floor hosts four bedrooms and a full bath. The rear wooden deck overlooks the fenced landscaped yard. The rear parking pad offers two off-street parking spaces. Newer wood fencing and rear shed are excellent improvements, and there is a high efficiency HVAC, and a full updated bath. The home's location places you within a very short walk to the restaurants and shops of both the S. Grand and Morgan Ford business districts. And Tower Grove Park, with all of its free entertainment, is only a few blocks away. Back on the market through no fault of the sellers. Designed to capture the character and charm of this iconic location near Carondelet Park, this completely renovated home features floor to ceiling construction improvements both inside and out. Front elevation showcases a bedroom addition, NEW siding, soffit/fascia, stone accents, roof, windows & door. The OPEN floor plan allows for views from the Great Rm to the charming Hearth Rm w/fireplace. The Chef's Kitchen boasts natural light, tile floors, stylish cabinetry, granite, backsplash & SS appliances. NEW interior finishes include laminate flooring, brushed nickel fixtures, can lighting, & custom trim carpentry. Quality construction w/new plumbing, wiring, HVAC & insulation. The rear yard oasis incorporates a covered patio, private walk, carport/cvrd patio, privacy fence, usable yard and original light post(1914). All new construction combined with a neutral color palette & selections make this home a one of a kind in the area. Huge Price Reduction! 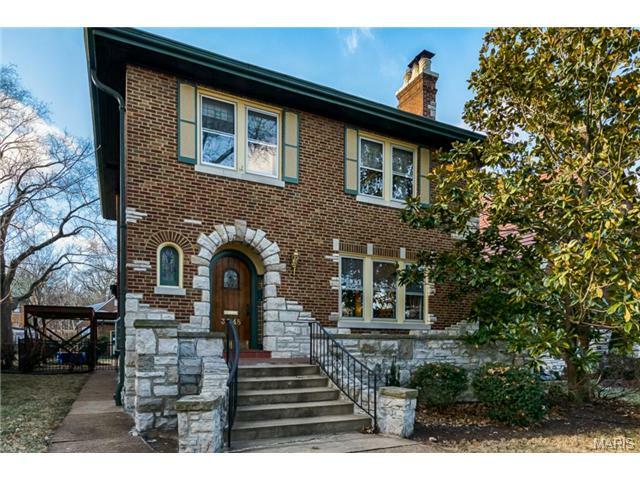 Welcome to 3705 Humphrey St. in desirable Tower Grove Heights, just steps from all the shops & restaurants on S Grand! All the big ticket items have been completed here & we already have a clear occupancy certificate. With some cosmetic work, this home could rival the neighboring homes that are selling for $350,000's-$400,000's. Updates include: Front porch rebuilt with maintenance free/low maintenance materials (2002); 2-car garage built (2003); Rear sidewalk installed (2003); Windows replaced & wrapped (2004); Front door replaced (2004); Tuck-pointing (2006); Solarium & 2nd floor deck addition (2007); New architectural roof (2010); Rear steps rebuilt with maintenance free/low maintenance materials (2016); New locks on house & garage (2016); Gutters & gutter guards (5 or so years ago). Large entry foyer. Formal dining room. Butler's pantry off kitchen. Gorgeous solarium off kitchen with deck above. 3 beds on 2nd floor & 2 more beds on 3rd floor. Fenced yard. $3000 AGENT BONUS FOR AN ACCEPTED CONTRACT BY 5-20-2019 xD; xA;BEAUTIFUL REHAB IN BOULEVARD HEIGHTS! GREAT LOCATION! MOVE-IN READY! ! Less than one block from Carondelet Park. This 4 bed/2 bath house is a must see. Upon entry, you'll be in the great room. Down the hall, you'll see a bedroom on one side and a full bath on the other. Next is the open floor plan kitchen that features custom cabinets, commercial grade appliances that will stay & and granite counter tops. The kitchen & dining room wrap around to an oversized sunroom. Upstairs, you'll find 3 large bedrooms and a full bath. One of the bedrooms has a washer/dryer hookup. There's plenty of storage in the W/O basement with an additional washer/dryer hookup. Both bathrooms have been updated. Once outside, you'll have the option to sit on your front covered porch or out back on your brand new 2 level deck. You'll have your very own driveway that was just refinished with new asphalt that goes all the way through to the alley. It will be love at first sight with this darling, fully renovated brick bungalow in Tower Grove South. This home gives you everything: location, outdoor space, modern finishes, main floor laundry, parking and finished basement space. This charming covered front porch is so inviting! The cozy, yet open floor plan let's the cook be part of the action while entertaining from the gorgeous new kitchen. The new main floor bathroom is on suite to the master bedroom, but cleverly 'Jack & Jilled' from the main living area. xD; xA;There's plenty of extra living space in the basement plus a second new full bathroom for overnight guests, and easy entertaining. The back deck is ginormous! It's perfect for outdoor entertaining. The yard is fenced, and the home is in walking distance to McDonald Park and gorgeous Tower Grove Park. This is a must see! Newest Model at Boulevard Heights CF Vatterott introduces the Carondelet model! This 2 story 2 bedroom, 1.5 bath new home can be expanded with a 2nd full bath upstairs, as well as a 3rd floor with a 3rd bedroom and full bath. Or additional bedroom. Optional finished lower level. xD; xA; xD; xA;Classic proportions in a new home located in Boulevard Heights - just steps away from Carondelet Park and the new YMCA rec-plex.Close to HWY 55 for a quick commute to downtown. xD; xA;Why rent when you can own, in the only new community in South City in decades! Unique Live/Work space. Solid, secure, out of the way space. Perfect for small business owner, Day Care Facility, Contractors, Auto Detail or Mechanic, etc.. Possibilities are unlimited. xD; xA;Shop has double car oversized workshop 29'x24' with 9'-10' ceilings, large floor drain, and a 16'w-9'h insulated garage door. 3rd bay (added on) 15'x24' has 13' ceilings with a 12'w-11'h insulated garage door. xD; xA;Living quarters include a full bathroom with shower, full kitchen with stainless steel custom cabinets, counter top and appliances. Large (added on) great room could be used for bedroom/living space, office space, playroom for Day Care, or any number of possibilities. Owner to leave all appliances, wall mounted flat screen TV, shop equipment, work benches, shelving, 60 gal. air compressor and refrigerator. xD; xA; xD; xA;Property is solid, secure, clean and has been well maintained. Welcome to 4651 Wilcox in the heart of South City! This home has been updated from top to bottom. The first level features a large living room, complete with built in bookshelves, an original fireplace, wood floors and modern fixtures. An open floor plan leads you into the dining area that features updated lighting and wood flooring. The renovated kitchen includes newer cabinets, appliances, countertops and tile flooring. The large master bedroom and an extra large bathroom complete the main level. Upstairs you will find additional bedrooms and an extra space that is perfect for an office or additional living space. The recently finished basement is the perfect place to host friends and family and includes another full bathroom. Other updates include the new detached 2 car garage, window treatments, extra storage, flooring and some newer windows. Schedule your showing today! Located in the desirable Tower Grove South neighborhood, this 2 bedroom, 2 bathroom historic row home has been impeccably maintained. Huge rooms, newer tilt-in windows, & tons of natural light! The updated kitchen features a greenhouse window, beautiful dark-wood cabinetry, & tons of wall space to add farmhouse open shelving if that sparks joy in you. No shortage of storage with a MASSIVE walk-in pantry! Take either the back or front staircase upstairs to a second full bathroom, two huge bedrooms (one has a pocket door! ), & a bonus family room at the top of the stairs. Plus a HUGE walk-in closet. The backyard is fully fenced & level. Don't worry about parallel parking, you have your own private double parking pad! Don't miss your opportunity to live on a premier street in a favorite city neighborhood within walking distance to Tower Grove Park, Botanical Gardens, Grand restaurant row, Hartford coffee... PLUS easy highway access! Come and see, you won't be disappointed!